After leaving Nepal far behind, we disembarked in New Delhi, India. Quite a fancy airport and it even has sleeping “cocoons” that you can rent if you have a long layover. 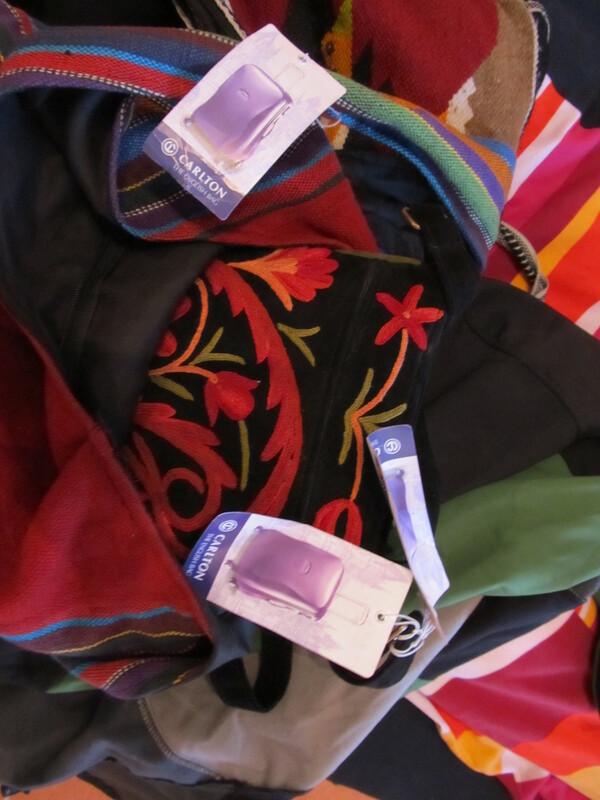 Once again we were given bag tags to add to our ever growing collection, I think I will look like a traveling Christmas Tree by the time I am through all of these. Waiting in line I met Hannah, returning to the UK after volunteering in Nepal for a few months. Going through security check number 2 or 3 since arriving at the airport, we had to scan our bags. Her’s was pulled to the side and the good humored guards asked where the little pair of scissors were. She argued stating there were none, but when she unpacked it she found it in a little side pocket. There was much laughter. As mine went through I took out my little pair before they even had a chance to ask, dang it totally forgot about them till Hannah was arguing. We joked that they should open a used scissor shop after work. It was refreshing to find airport security with a sense of humor. 1) Past immigration and security no FOREIGNER could exchange money (only Indian Passport holders). Since transit meant I was already past security meant I had no hope of being able to do this. 2) They don’t take Nepali Rupees. GO FIGURE!!! It was suggested that one of the Duty Free stores might take them, but after about 15 shops both Hannah and I realised there wasn’t much hope. Mmmmm guess it means I just have to go back to Nepal. 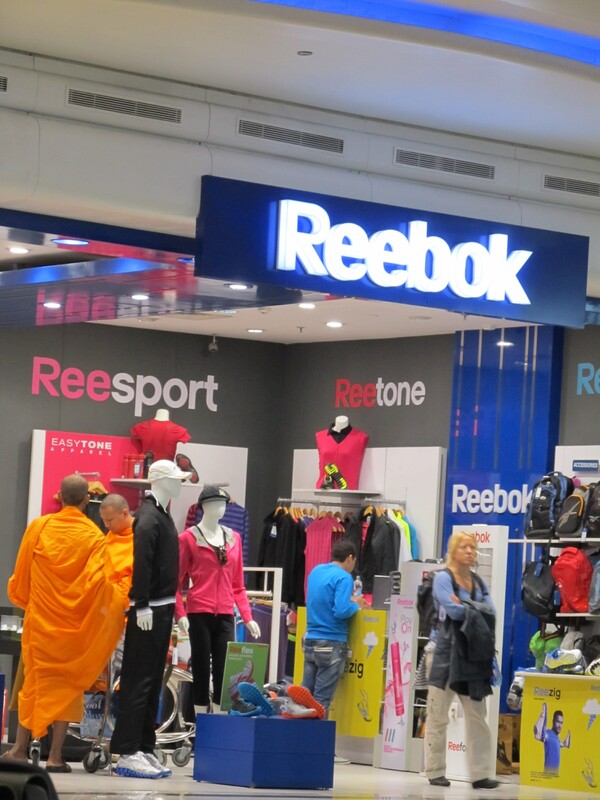 I can barely afford Reeboks and here are 2 monks buying a pair of stylish running shoes in the Duty Free Shop (which is usually twice as expensive). So far Jet Airways had been pretty decent and I hoped this would continue with the 11hour flight to Milan looming in my near future. After an hour delay it was time to board, then a further 30minute delay we were finally in the air. I was in the middle section on the aisle with an Indian mom and 2 boys. For the most part they were reasonably well behaved, but there was the occasional elbow in the ribs when they weren’t concentrating. Luckily Jet outdid themselves with individual entertainment units, great service and decent food. I think I even managed a bit of shut eye, which is rare for me unless I have a row to myself. Finally landing in Milan and feeling decidedly travel worn already, I wandered through the airport towards my gate, which was on the far end. On the way I thought it wise to draw some Euros, but at that precise moment could not remember if Italy used them or not. I asked at one of the duty free shops and after a bit of confusion with translation I got my question across and the fact that I was brain dead at that moment. We all laughed and they pointed me in the direction of an ATM. Of course it was all in Italian without the option of English (if there was one it was probably asking in Italian if you wanted English). Oh well, it was a good thought. Went through another security check and finally found my gate, I literally think it was at the end of the airport. Another hour long delay so I decided to buy some internet time just to let all those who needed to know that I had made it this far. The plane was almost empty and I just hung back to board up hoping to get a front row to sleep. Thank karma I did, the attendant too one look at me and didn’t argue, pointing me to the second row. I think I was out for the count before the plane even left the ground. I woke up just before we landed and before my eyes were even in focus the attendant was offering me the snack and juice I had missed at the beginning. I love good service and was very appreciative of this. Germany was not just a country of random choosing like most of the others. At the very beginning of my trip, in my first country, I had met an awesome girl by the name of Cathleen in Aguas Calientes. You can read about that in my entry “Aguas Calientes Day 13”. We had always joked about me visiting her on my way home but never really thought I would get the chance to. Once I realised I was going to Nepal and would head home over Europe it just seemed like it was meant to be. Cathleen lived in Leipzig in the former Eastern side of Germany but had traveled to Hamburg to meet me. As I got off the plane and wandered through the non existent immigration check (still very strange to enter a new country without all that rigamarole and slightly annoying as I now don’t have a German stamp in my passport), I felt exhausted but was very excited to see my friend. She was there with her friend Hendrik who lived in Hamburg. He had driven her to the airport which meant no dealing with public transport, he also gave up his bed for us. I was exhausted but still had many things going through my mind and still trying to fathom that my year of travel was only 2 weeks from an end. This would prove to be a difficult idea to wrap my head around in the weeks to come. But for now, there was a new country to explore and a great friend to catch up with. So this is me and my crazy plan! This is me! And I am about to start an adventure of a lifetime, round the world and volunteering. Now most might think “well that’s great, go for a few months see the world, all young people should experience that before settling down”. However I am not your usual “young person”. I turned 33 yesterday and bought my ticket for the first leg this afternoon. Now some might think this is an early mid-life crisis, but you would be mistaken. I have been thinking and dreaming of this for many years, but had to come to grips with not only the reasons for doing it but also the guilt of not doing what a responsible 30-something should be doing. When the dream started a few years back it was me wanting to run away, not knowing where I fit in, not feeling American (I am an immigrant from South Africa) and yet not feeling part of my homeland either. Kind of a world citizen I guess one would say. Add to that, a feeling of guilt and pressure (most likely my own imagination) every time I left to go travel, or explore. I mean, I could have put a down payment on a house instead of riding an ostrich or sitting in Angkor Wat or dancing with the ladies of Lesotho… isn’t that what every responsible young adult is supposed to do?? But then I remind myself that all my travels and explorations have been done on my own dime and I have never been at want for anything. It’s also helpful having the folks as a backup and to crash at theirs on occasion. Am presently saving money living with the folks and working as a vet tech. They give me cheap rent and I do chores. I think that’s a fair trade and should not be something to be embarrassed about. So here I am, just bought my ticket to Peru, trying to learn Spanish, figuring out what shots I need, and how to get visas, all well trying to stay sane enough to enjoy the process. I hope you will join me on my voyage of discovery, and help me prove that you don’t have to be 20-something to see the world!